Subscribe and get the first lesson free! 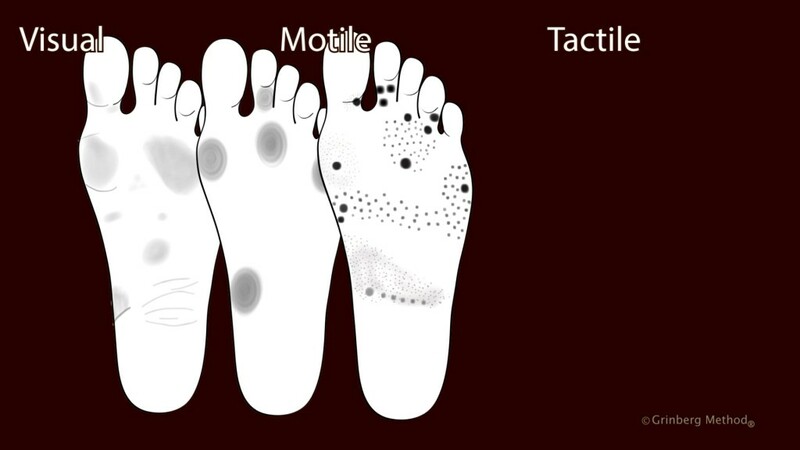 Footwork is a technique created by Avi Grinberg, developer of the widely-used practice Holistic Reflexology as well as founder of the Grinberg Method, which itself is now practiced in Europe, Israel, and the USA. 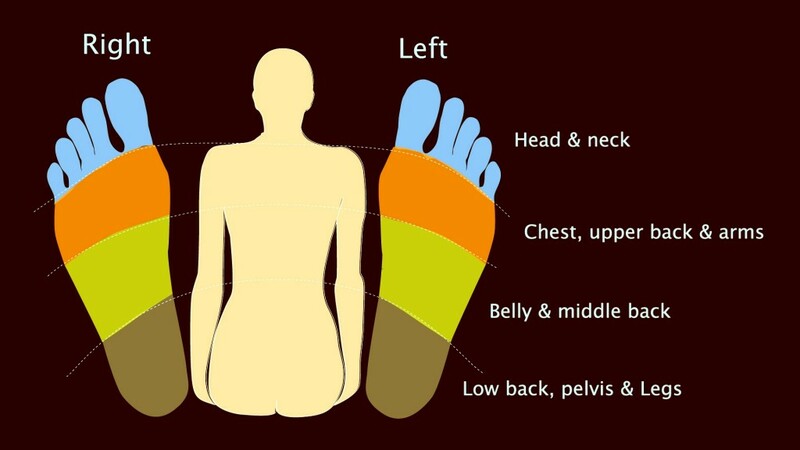 The technique developed reflexology into a holistic mind-body approach, using the body’s ability to get well naturally and individually. It combines the advantages of teaching through the body – where conditions and symptoms are experienced, with the benefit of guiding and focusing the client’s mind through verbal instructions. Footwork teaches the whole person, focusing on what we can observe through the feet about where a person is making unnecessary effort and where they are losing energy in their body. 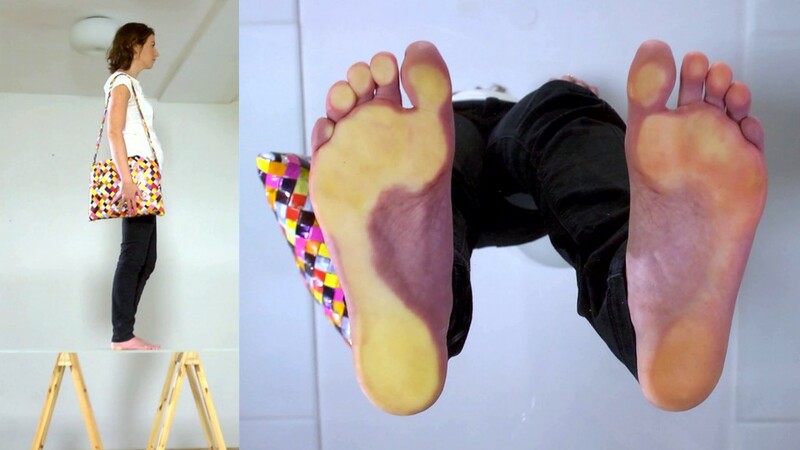 The technique allows you to affect every part of the body through touch on the feet, in line with a detailed map indicating effort and energy expenditure in the body, a map which you create individually for every client. It is designed to turn your client or patient into your partner, who can then actively engage in the healing process and implement the tools they learn with you in their daily life, for an abiding change. When you learn this technique you will be able to use its concepts and forms of touch to create stand-alone sessions and follow longer processes. You can also integrate it into other modalities of therapy or bodywork that you already practice, targeting the people and aspects of your work that could benefit from it the most. The technique highlights the practitioner’s wellbeing, because your level of energy, attention, and relaxation affect the results: the more well you are, the more you can perceive and teach wellbeing and with it, create a more powerful and satisfying workplace. The Footwork technique is effective, generating long-lasting results, because it empowers a natural function. Our bodies have the capacity to be much more alive than we usually allow them to be. Footwork teaches you with precision and depth how to tap into the body’s huge natural ability to continually rebalance, repair, heal, and regenerate. You learn how to recognize patterns in a client’s body that continuously reduce their wellbeing and you acquire the practical tools to teach clients, based on this information, to break free of these patterns. The technique achieves greater wellbeing for the client by first creating the conditions in which real learning happens. You learn to give the body the time, energy, and attention it needs to focus on what disturbs it and devote its resources to rebalancing itself. With more quiet concentration, energy, and relaxation, the client’s body can work very intensively and efficiently. Footwork generates quick results and because the client is fully engaged in each physical and experiential step of the process, the results can be very long-lasting. Since it can be a pleasurable and very interesting experience for clients to participate so actively in their own wellbeing and healing process, they have many incentives to continue learning, long after the initial complaint is gone. In 6.5 hours of video material divided into 5 lessons, 150 pages of supplemental workbooks and a comprehensive reference eBook with detailed case studies, Avi Grinberg teaches you both the concepts and application of his approach to teaching the whole person through their feet, tapping into their personal and physiological potential. You learn 20 distinct forms of touch that evolve into a fluid physical language, teaching the client about relaxation, breathing, silence, and focusing on what they can achieve through heightening their attention to and in their body. And you study ways to adapt the technique to each individual and structure a learning process focused on that person’s needs. At the course’s conclusion, an 80% score in the multiple-choice online test will grant you a Certificate of Completion. The test is recommended, whether or not you wish to earn your Certificate, as an interesting and enjoyable way to assess what you have learned. This online course introducing Footwork technique is the culmination of 40 years of research, practice, and development. Footwork distills original material taught normally over a 60-hour course and synthesizes the efficiency of the online format with the powerful quality of learning directly from the technique’s author. It is designed to allow you to exploit its effectiveness to enrich and grow your own professional practice, whether you work exclusively with this technique or combine it with other modalities. The course is an investment that continues to pay off as long as you practice it, since the technique and your mastery of it can deepen with every new application. The course reflects every aspect of Avi’s teaching style: intense, extremely clear, well-structured, and full of humor and warmth. Along the way, you will be presented not only with background knowledge and information, but also with the practical steps you can take to implement the Footwork technique as it is most fitting for you professionally. You see demonstrations close up and watch full sessions in this highly interactive and engrossing video format. There are many advantages to learning online. You save on the cost of travel and lodging, and you don’t lose working hours. You can study at your own pace rather than having to follow a group, and at your own convenience – as your schedule permits. You can stream the course on your mobile device to continue learning as you commute or travel. Footwork: a Footpath to Wellbeing, by Avi Grinberg (2015, PDF, 141 pages), is the perfect companion to the online course – a place to delve more deeply into the underlying concepts and principles taught in the videos and workbooks. The career of the health or wellness provider can be one full of joy and interest, affording an intense and rewarding connection with people and the satisfaction of seeing improved wellbeing. But just as clearly as the healing arts offer genuine connection and fulfillment, their practice confronts many with common and formidable challenges. Wellness professions cover a huge range, but at the core they tend to share an abiding interest in the dynamism of the human condition: our hearts and spirits, our thoughts and emotions, our ability to grow, learn, and change – how our bodies function and heal, and how our minds work. Often the impetus to practice a healing profession stems from being touched by pain or imbalance: physical, mental, or emotional, in both ourselves and others. The reality of suffering activates many people’s longing and ambition to cultivate ways of promoting our potential to be well and to thrive. People work in this field because they have the wish to join and aid others on their path to better health. This is part of the passion driving the healing arts. But co-dependency and the need to provide solutions in the healthcare sector create the risk of diminishing practitioners’ own wellbeing, effectiveness, and enjoyment of their work. The inadvertent and yet prevalent relationship dynamics that can arise between practitioner and client divert and consume a great deal of the real healing potential in the client’s body, as well as the clarity needed to identify real sources of dis-ease. No one is served by this depletion of resources. When pain or imbalance are not approached as a problem, the basic assumption that we need to help is fundamentally altered. The shift to teaching allows for the best conditions for the body to heal itself, and invites each client to commit with full participation and responsibility to their own process of gaining health and wellbeing. In a Footwork session, clients become self-directing partners and experience actively how improved health and wellbeing lie within their power. Practitioners can adopt the role of an ally and co-pilot in their clients’ discovery of how to be well, integrating into their practice the perspective of Footwork – from one of needing to help, to one of supporting and empowering the natural abilities and functions of the body. A Footwork session taps into a client’s will to learn and fosters it, uniting practitioner and client in the process of learning and working together towards a common aim. The quality and depth of this partnership has a chance to evolve in a structured way, leading to long-term results and a powerful and satisfying experience for both practitioner and client. In a Footwork process, letting the body work is the key to achieving the desired goal – the client’s recovery or improved wellbeing. This practice alters the roles of practitioners and client, since the teacher here does not know more than the student, but rather, both learn together how to let the individual body’s knowledge (and ability) come to the forefront. Repetition and rote use of learned techniques and applications can often create physical symptoms in the practitioner such as energy loss, pain, and boredom. The Footwork technique, with all its tools, is designed so each individual session is tailored to each client, with constant adaptation to the client’s body in each moment. Practitioners have the space to recover their creativity and pleasure in giving sessions, encountering and flowing with the power of a body as it works. Clients experience in a Footwork session that you are always with them. This manner of touch has, itself, an enormous healing power for many people, whose bodies need someone to be simply fully present with them, in order to relax enough to work and heal effectively. Learning to follow your client this way – to flow and dance with their body – turns your work into an art. Utilizing the Footwork technique raises your own level of energy and teaches you to maintain attention in your own body while working. Your working experience becomes more energized, pleasurable, and effective, transferring directly into your quality of life and passion for what you do. Designed for professionals in the field of wellness and health, the five lessons that comprise the Footwork course build on one another consecutively to teach this original technique. Through the lessons, workbooks, and reference eBook, you learn how to harness the natural ability of your clients’ body to heal themselves. By heightening their body attention and allowing their bodies to work, they will learn how to break free of patterns that reduce their wellbeing, to achieve long-lasting results. In the first three lessons you learn all the basic tools and concepts of the Footwork technique. The last two lessons teach you to combine them together to create a structured learning process adapted to each individual client’s experience and needs. 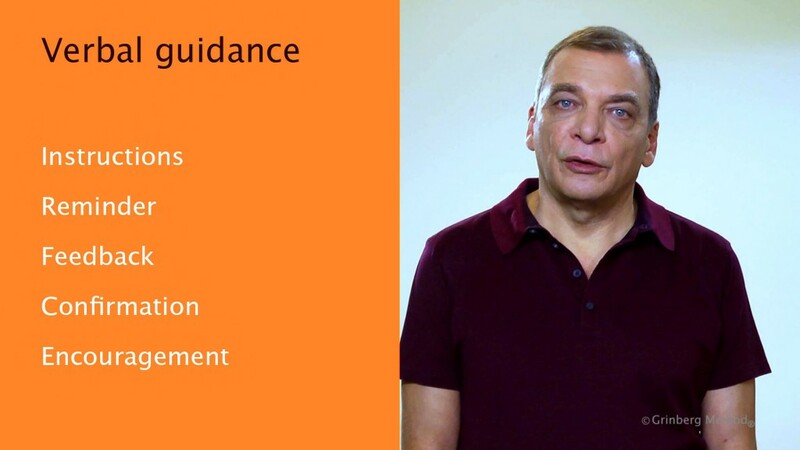 All the lessons include footage of sessions given by Avi Grinberg to demonstrate how the concepts and tools flow together when working with clients. A special focus is given to exactly how the technique should be practiced, aiming not just to protect but also to strengthen your hands and increase your overall level of energy, attention, and concentration while working. Lesson 1 introduces both the practical and philosophical foundation of the Footwork technique. 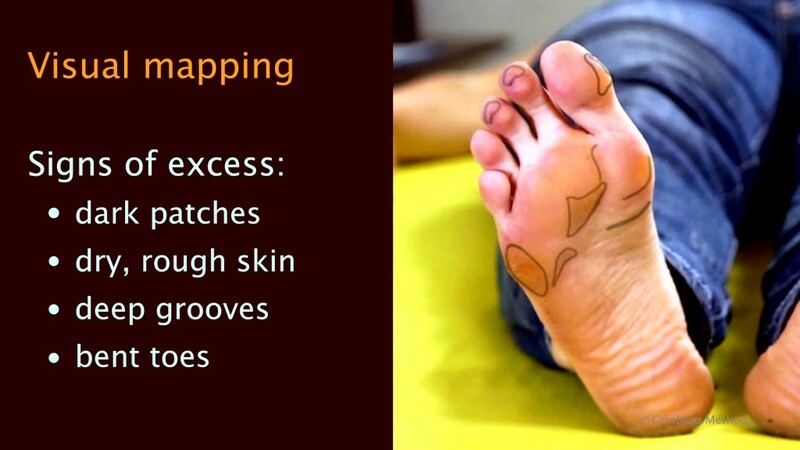 Here you begin to learn about Footwork’s mapping of excess effort and energy loss in the body, through indications in the feet, while also looking at what body attention is – along with what it can achieve for your clients’ wellbeing and your own. You will gain concepts and tools that you can begin to apply in your practice immediately. Practicing this first lesson, you will be able to start the fruitful journey of tapping into the body’s extraordinary natural capacity to balance itself, which is central to the long-lasting results and overall efficacy of the Footwork technique. This lesson focuses on how to recognize more clearly through the feet where the body of each client is struggling and what it needs. While gaining more practical tools, such as new forms of touch and of verbal guidance, you learn to individualize your work and to focus your client’s mind and body towards achieving their goal of becoming more well. The focus of this lesson is creating and strengthening your partnership with the client, as well as accurately defining what disturbs them, in order to achieve most effectively the results they seek. The lesson teaches you ways to engage your client to be actively present in the session. You also learn to elicit a description, rather than an explanation, of the client’s experience and then combine this description with what you see in the feet, overall heightening the client’s body attention and ability to let their body work. This lesson teaches you to create individualized, clearly-structured sessions that meet the needs of each client. Here you learn to begin your session with purpose, to work clearly towards your aim during the session, and to complete it in a way that creates both optimal focus and clearer results for your client. The lesson also guides you through using your own increased body attention and perception to follow your client’s learning and the needs of their body moment to moment, to be fully with them. This lesson teaches the transformation of Footwork from a technique that you apply, into an art. You will train here to create sessions that flow between the forms of touch, as you recognize and adapt to the present state of your client’s body, guiding your client and making them your ally. This motivated and fluid partnership allows both client and practitioner to finish the session with more energy and vitality. And being well turns into a practical, enjoyable, and interesting part of daily life. Here you also learn to develop a process consisting of multiple sessions, to tailor each one to the body’s current learning, and to raise the level of intensity and attention in your working room. You do this in accordance with what each client needs, for them to be able to learn most effectively and achieve what they truly want, and in a way that advances your satisfaction and health in your own practice.